Variety is one element that’s never missing in adidas Poole Week. The racing started on Sunday under overcast skies, with a south-westerly wind gusting to 25 knots and the harbour as choppy as most people ever get to see it. Monday was brighter and a little lighter, and then it was all change on Tuesday. 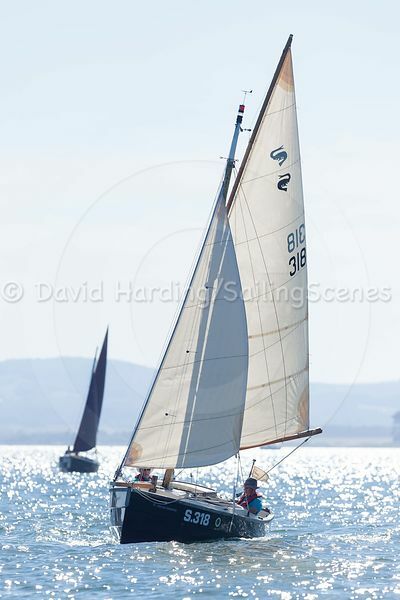 As forecast, the wind switched to the east and the sailors were treated to a day of unbroken sunshine. But that wasn’t all. Those who had been hoping for conditions that would give their aching bodies a rest had their prayers answered: after starting off at a pleasant 12-16 knots, the breeze moderated throughout the day, almost fading away altogether at times towards the end of the racing. Whether or not the change in conditions was responsible, the day brought new faces to the fore in some fleets. 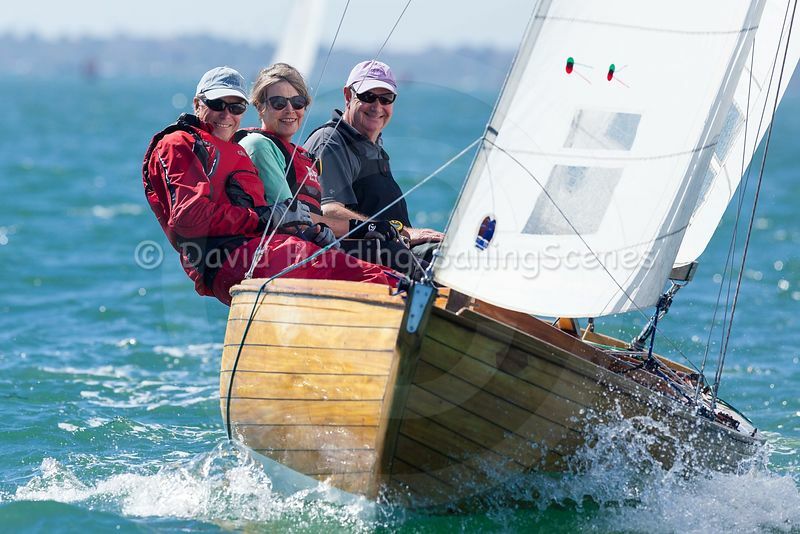 In the Lasers, Roger Hakes continued where he had left off on Monday by winning the first race, but then it was the turn of Roger O’Gorman, who had just arrived from Queen Mary SC, to take the honours in race 2. He followed that with a second in the third race, making the rest of the front-runners pleased that he hadn’t been there for the first two days. 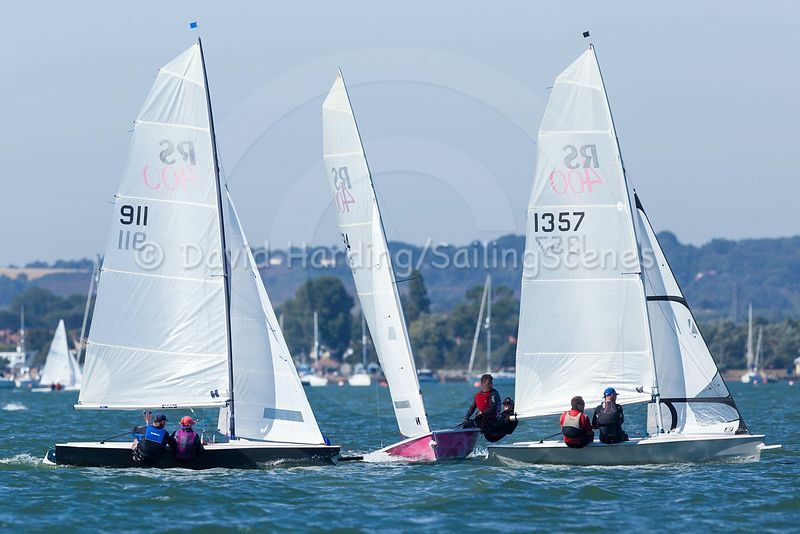 For all the exceptionally tight (but still mostly friendly) racing in the Lasers, Flying Fifteens and XODs in particular, plenty of sailors are on the water principally to have a good time. 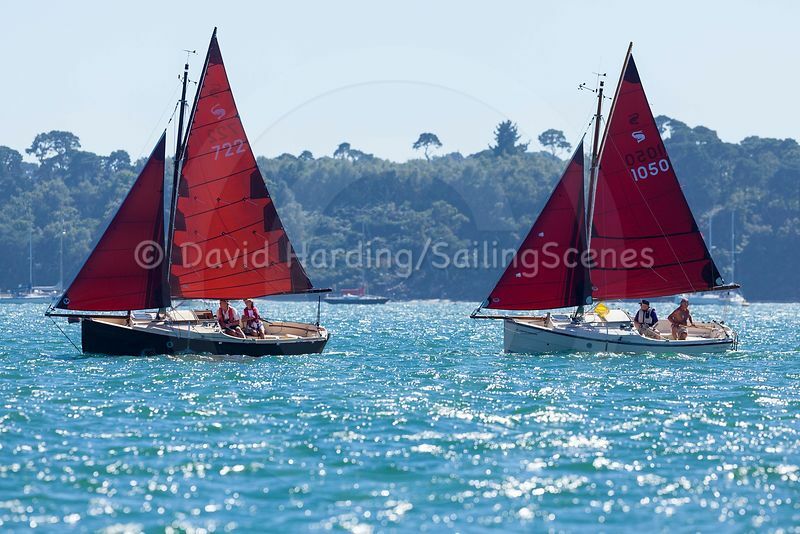 This is very much in evidence in the handicap fleet, where you might see a Laser 4.7 crossing tacks with a Bembridge Redwing or couple of youngsters in an RS Feva engaged in conversation with the crew of a Hawk as they keep company downwind. It’s often surprising how two totally different boats can go at such similar speeds. 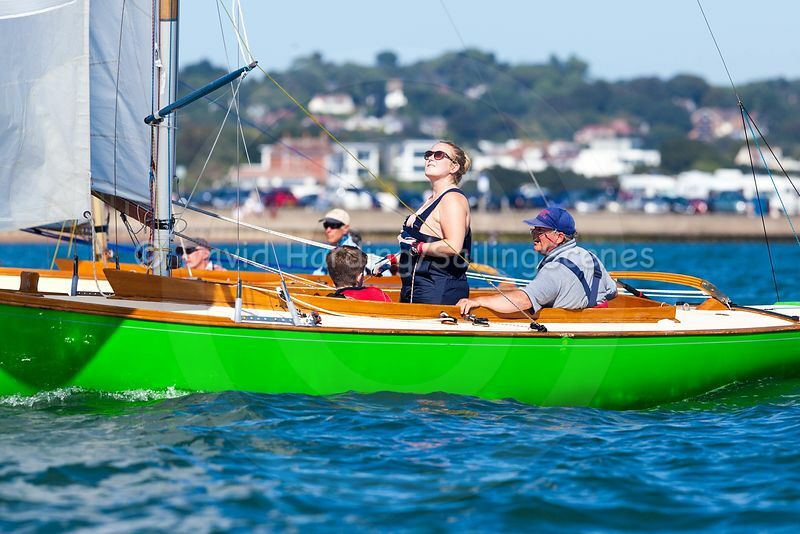 With an RS Aero, a Contender, a Laser EPS, a Fireball and a Dart or two among the 24 entries it has to be one of the most diverse handicap fleets to have graced the waters of Poole Harbour for many a year. Diverse doesn’t mean uncompetitive, however, and today it was the turn of the Merlin Rockets to show the others the way round. 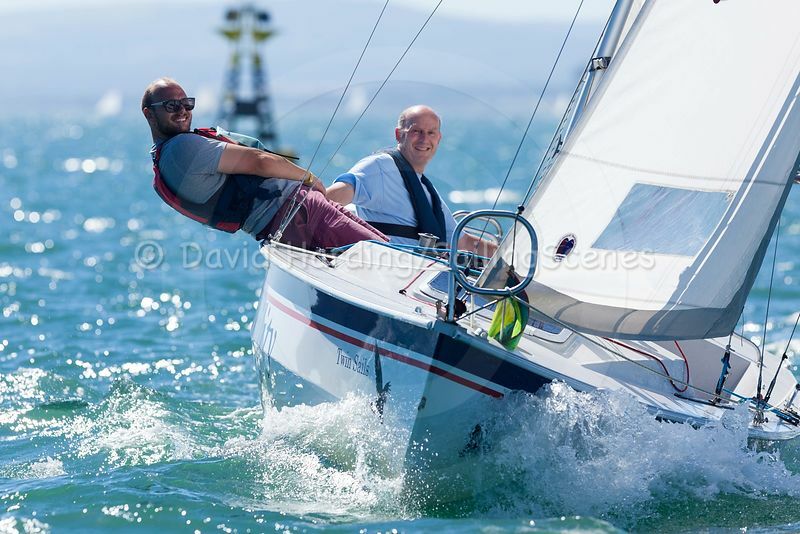 Steve and Ally Tyler scored two firsts, with Dave and Frances Bursey not far behind them all the way around the multiple laps of a triangular course on the northern side of the harbour. Venturing rather further afield were the Dolphins and Shrimpers, whose course took them to a buoy on the east side of Brownsea Island and then to a leeward mark near the start line of the Lasers and Flying Fifteens way out west towards Arne. How they got down there was up to them: double back around the northern side of Brownsea, or carry on clockwise up Blood Alley and cut through between Brownsea and Furzey islands. Every boat in both fleets chose the latter route, which was certainly quieter and more scenic. It wasn’t all gentle sailing, however. 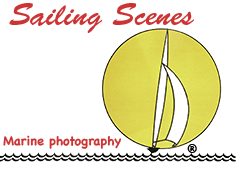 Having had a cringle pull out of the mainsail just before the start to scupper his race on Sunday, Peter Fontes on Roatan saw his mainsheet block disintegrate while he was locked in battle with David Dorrell’s Humpol. This let Dorrell get away, but Team Roatan managed to fashion a workable solution out of the remains of the block and a lashing and carried on to finish the race. 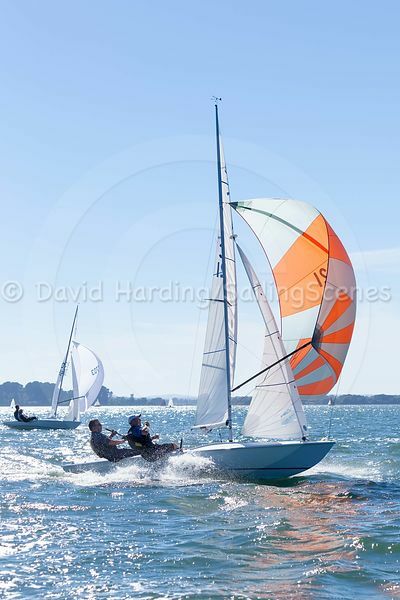 While some sailors in high-performance classes might dismiss Shrimpers as a bit old and ploddy, in Poole they race them hard enough to break them – or at least bits of them. 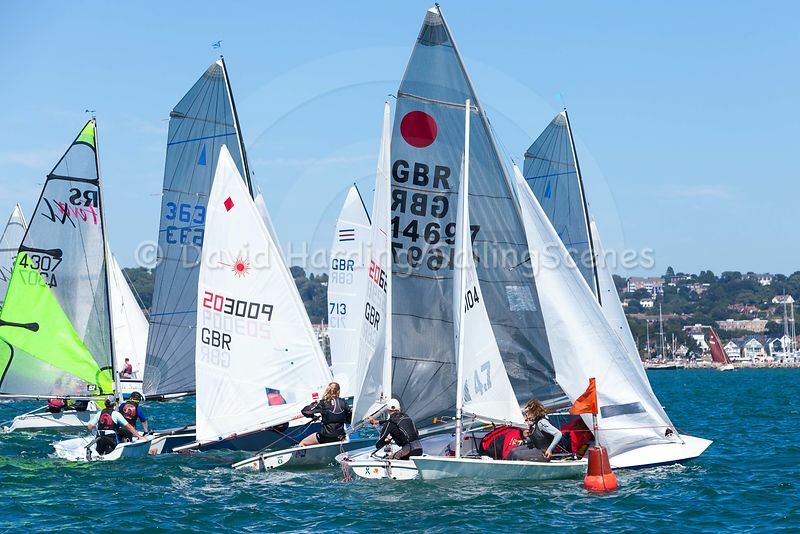 The forecast for the rest of the week is for weather that’s more likely to break paddles than boats, but with three days of great racing behind them the competitors in adidas Poole Week are ready for whatever comes their way.